Black Friday is the Friday after the Thanksgiving Holiday when many Americans start their Christmas shopping and it’s one of the biggest shopping days of the year. Unfortunately for GlassWire black Friday turned black for a very different reason. Google’s Chrome put GlassWire out of business by blocking 50% of our website visitors from downloading our software. Friday morning we were shocked to receive emails from GlassWire fans stating that Google’s Chrome browser would no longer allow them to download our software. The error from Chrome said that GlassWire would “harm your browsing experience” (please see the photo above). GlassWire is a privacy and security related software and makes absolutely no changes to the browser. By using GlassWire people can find applications or websites that are invading their privacy and in other situations GlassWire users can find malware their antivirus missed. We started GlassWire to help protect people from malware and we would never make changes to a user’s browser or computer without their permission. We have never bundled any software with GlassWire or made any changes to a user’s browser ever for any reason. Occasionally all popular software gets false positives from antivirus software and I think that’s normal. Antivirus software companies almost always have a clear “false positive” submission form or another way to contact them to solve the problem. Also the antivirus business has a lot of competition so if one antivirus temporary gives your software a false positive then it won’t do major harm to your software installs. There is no single antivirus company that I know of that has 50% market share. Unfortunately around 50% of our website visitors use Google Chrome so Google has now shut our startup down for half of our website visitors. We’re also extremely concerned how this false warning will effect our website ranking in Google’s search engine. We requested a review in Google’s webmaster tools so we could be unblocked by Chrome but unfortunately for the thousands of people who visited our website with Chrome, GlassWire is now associated with malware that may “harm your browsing experience”. I have read blog posts over the years about how Google blocked a website or ruined a business and it usually ended up that there was a valid reason for Google taking the action it did. In our case if I find out there is a valid reason we were blocked I’ll post it here so I can help other start-ups avoid this situation. Since GlassWire makes absolutely no changes to the user’s browser in any way I don’t understand how this block from Chrome could be valid. GlassWire’s file is listed here on VirusTotal with no problems and of course we make no changes to any browsers at all and we never have. After requesting a check by Google’s Webmaster Tools on Friday morning the Google Webmaster Tool replied by saying our software is still malware and refused to remove the block. We just submitted a second check via Google Webmaster Tools but we’re not sure what to do next. If Google Webmaster Tools gave the hash of the file that was supposedly malware so we could confirm it was ours that would be useful but instead they just show our .exe download link here https://www.glasswire.com/download/GlassWireSetup.exe. Of the thousands of GlassWire fans that have downloaded the software on Firefox and IE since Friday, zero have reported or suggested that there is any problem with the software. We even put up our installer’s hash here with every software release so users can double check they are downloading the correct file. It’s extremely upsetting to learn the project you poured your heart and soul into for over a year is now inaccessible by 50% of your website visitors. We have tried following Google’s guidelines to fix the problem but it isn’t working and their information is minimal. 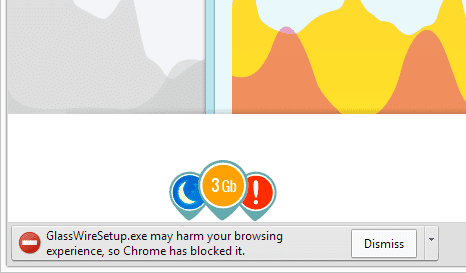 Has your software been blocked by Chrome due to a false positive? Tweet to us at @glasswirelabs or post your comment below. Meanwhile, to download GlassWire please use Firefox or Internet Explorer. December 2nd Update: GlassWire is now unblocked by Chrome but Google Webmaster Tools still say we are infected with malware. However when we go to the “manual” page as suggested by Google we find that no actions are found. Also under “Security Issues” it says that “we haven’t detected any security issues with your site’s content”. Our theory on this is that Google removed the block on their end but Google Webmaster Tools is still not updated on our end for some reason. Hopefully this won’t hurt our search results in the future. Thanks everyone for your help on solving this problem and thanks to the people who helped at Google! December 4th Update: Someone at Google informed us that we just needed to delete the last message about malware and it would clear up the malware report that appears after logon in Google Webmaster Tools. We deleted the message and now everything looks OK. We’d like to thank the team at Google yet again for clearing this up. Thank you! I can understand your frustration but what i cant understand is why are you only complaining without just simply providing download mirrors or changing the file name may be and compress it to .rar for example.. Im not an expert but thats the first thing that would come to mind since google will most probably not remove links or info from your page and wont block external links… I didnt check but chrome usually blocks only some .exe files. P.s i have no idea what your software is and never been on your respected site. Sorry to hear about this! I passed it on to the team that works on this here to double-check what’s happening, or perhaps give you more information (if there’s something that we can pass on). John, Thank you for your help. Deejo, I talked to another company with a similar problem and they said changing to a .zip only worked temporarily. Plus I think changing to a .zip is confusing for users and it makes it look like we did something wrong when we did nothing wrong at all.